An almost ghost town, the Shaniko area was first settled by a pioneer named August Scherneckau. Arriving after the Civil War, Scherneckau bought a farm near the present site of the town and when Indians pronounced his name as Shaniko, the locality became known as such. On the stage route from The Dalles to central Oregon, the Scherneckau ranch soon became the site of a stage station. The first post office was established on May 23, 1879, with August Scherneckau as its first postmaster. Officially called Cross Hollows for the local topography, the post office lasted only eight years, closing on May 27, 1887. In 1900, an official community was planned and built by businessmen in The Dalles for the terminus of the Columbia Southern Railroad. 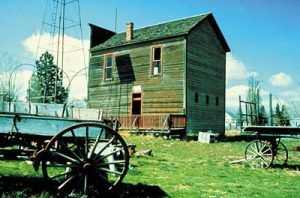 The station was to be utilized to collect the enormous quantities of wool being produced in central Oregon – a role, it continued to play into the 1940’s. The Shaniko post office was established on March 31, 1900, and in the same year the, Shaniko Hotel was built. 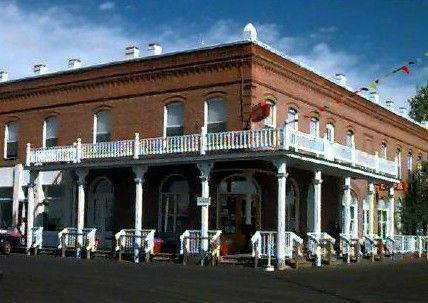 First known as the Columbia Southern Hotel, the structure was built with 18-inch thick walls and handmade brick and is on the National Register of Historic Places. Also built in 1900 was the 10,000-gallon wooden water tower. The water, pumped from nearby Cross Hollow Canyon, was piped through a wooden pipe system and stored in two large wooden tanks. Within a year, two financiers from The Dalles, B.F. Laughlin, and W. Lord, constructed a huge wool warehouse in Shaniko, the largest in Oregon at the time. 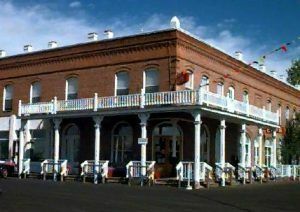 Shaniko quickly became a major trade center for the wool produced in central and eastern Oregon. The three-room Shaniko School, built in 1901, housed kindergarten through high school students until 1946. Over the years, it fell into disrepair but was restored during the 1990’s and now serves as a community hall. 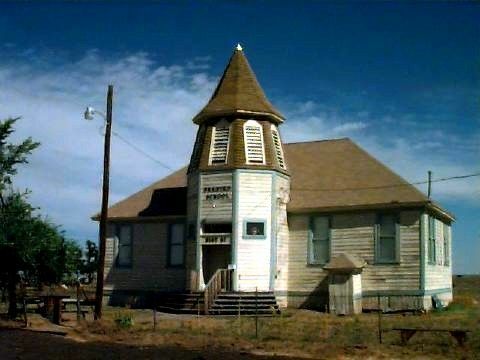 It is one of the most photographed old school buildings in the state of Oregon. It was also in 1901 that Shaniko was officially incorporated. By that time the town had a bank, two blacksmith shops, a two-story, city hall that included the fire station and the jail, three hotels, two newspapers, a post office, five saloons, two stores and many other structures. Church services were held in the school building. In 1903 Shaniko was referred to as the “Wool Capital of the World” after three wool sales brought in the largest total sale of wool on record to date. The next year, sheepmen sold an estimated five million dollars worth of wool to buyers in Shaniko. In the 1910 census, Shaniko claimed a population of 600 and its future seemed assured. However, in 1911 the Oregon Trunk Railroad, linking Bend (70 miles to the south) to the Columbia Gorge, began to draw business away from the more isolated Shaniko. Soon thereafter, a fire destroyed much of the downtown business district and there were no funds to reconstruct the damaged buildings. Although homesteaders, ranchers, and sheepmen continued to reside in the area, Shaniko began to fade. Today, this almost ghost town supports a population of just 20-25 people, but there is much to see in Shaniko and many claim it is the best ghost town in Oregon. The enormous sheep sheds of that era still stand on the edge of town. 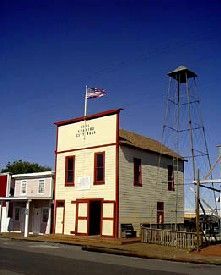 Several of its buildings are maintained in an Old West theme, complete with authentic boardwalks and false fronts. Still standing are the old water tower, the City Hall complete with an old jail, the school, and post office. The Shaniko Hotel is the town’s biggest attraction. Restored to its former grandeur around 2000 by Robert Pamplin Jr., the hotel featured an antique shop, history of many of the families who once lived in Shaniko, and a café with home cooking that was said to the best in the area. However, a Legends reader has alerted us to the fact that Pamplin wound up in a water rights dispute with the town council, and now the Hotel is closed again (as of 2009). Our reader also says that while the town remains a historic destination worth seeing, there’s no place to stay now that the hotel is closed again unless you are an RV’er or camper. The old Shaniko Livery Barn now stands as a museum featuring a number of antique cars in their original state. Next door is the Shaniko Sage Museum, also available to visitors. A number of antique and gift stores have been established in the other historic buildings in the tiny downtown district. These businesses appear to be open April through September. The community of Shaniko is located on Highway 97 in southern Wasco County, about 20 miles southeast of Maupin and 70 miles north of Bend.